TLC Kanvas is true family owned and operated full-service canvas shop that cuts everything from Tupperware bags, to inventory bins for large trucking companies, to dog collars — all with the best quality. Lonnie and Carol have been married for 40 years, and opened shop in 1980 when Lonnie got out of the Marine Corps. Lonnie says he’s handy and claims Carol is “the best engineer without an engineering degree you’ll ever meet.” Two years ago they added Carol’s brother Todd to the team. 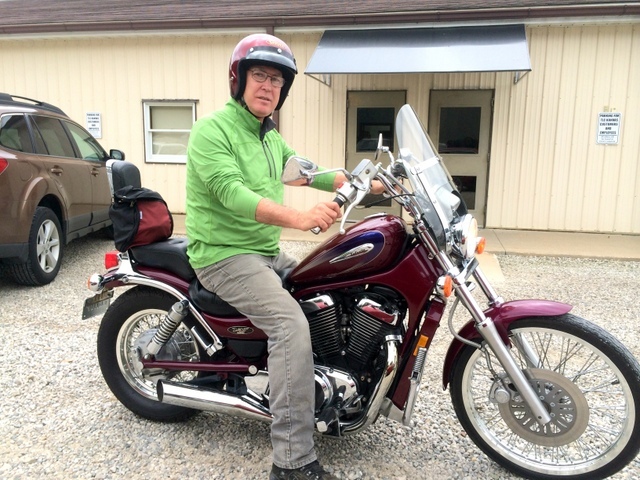 With Lonnie’s grit, Carol’s know how, and Todd’s financial background (he previously worked at Arthur Anderson) they are ready to tackle bigger jobs with an eye toward systems, numbers, and profitability. Thumbs Up from the TLC Team – Lonnie, Carol, Todd, and their cutter operator Sue. For over 30 years their motto has been — no job is too small, or too big, we do it all! 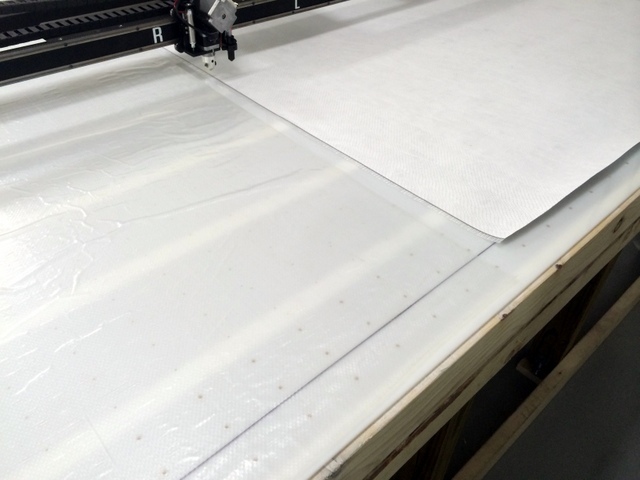 To help with their thriving bag business in the early 90’s they purchased a complex automated cutting system that didn’t survive a transition in the business. 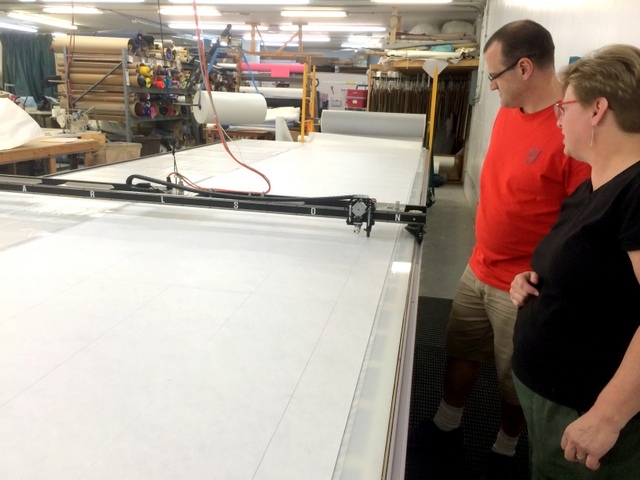 Twenty years later, looking to get back into automated cutting, they wanted a cutter that was as simple, reliable, and affordable as their new business plan. 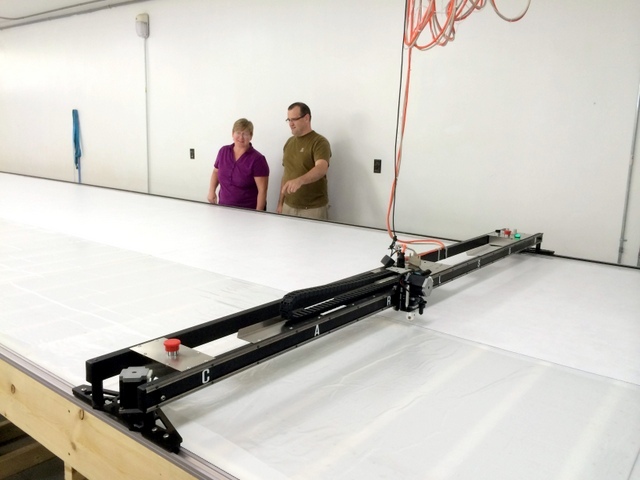 They decided on the Carlson Design PT-108″ Plotter/Cutter on a home built 40′ long table. 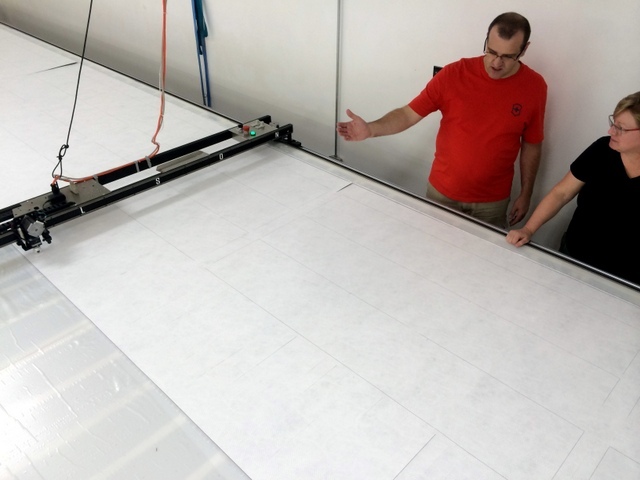 TLC estimate a one-year Return-On-Investment due to a 10-20% savings in sewing time alone – less notching, marking seam lines, and cleaning up cuts, meaning the machine will have paid for itself by the year’s end by return its original value to the bottom line. 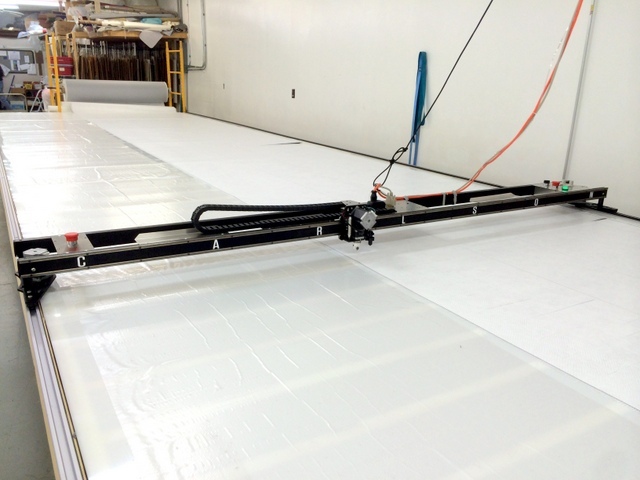 By the time TLC also factor in cut-time savings, reduced fabric waste, and harder-to-quantify savings due to improved quality – on-time delivery, fewer returns and re-cuts, for example – they should exceed their initial ROI goal. 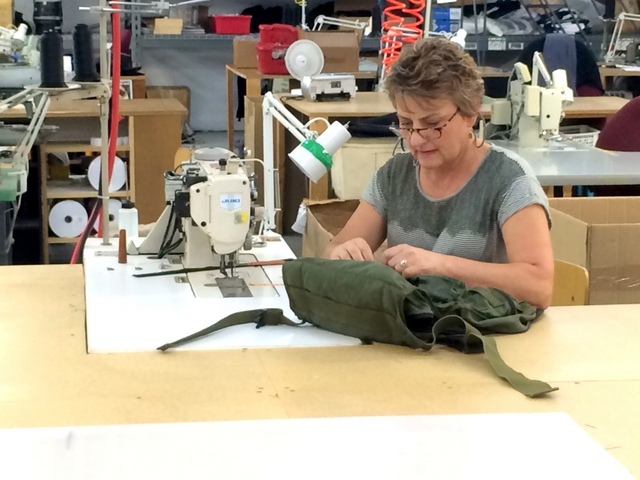 Small custom bags use to make up the majority of their business, but in the last few years they have moved to larger projects. These projects have helped them realize year-over-year revenue growth in the 30-60% range, and bags now make up only 5% of sales. 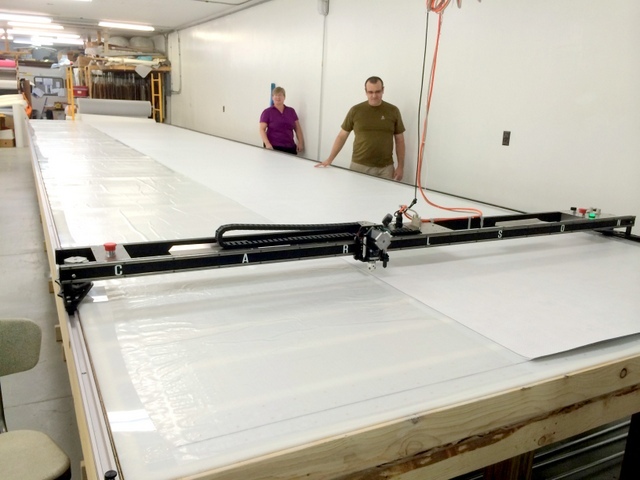 This growth is driven by a focus on larger quality canvas projects like inventory racking bags for major trucking companies. Custom bags used to be their bread and butter. They now make up less than 5% of sales, with production shifting to larger commercial products. 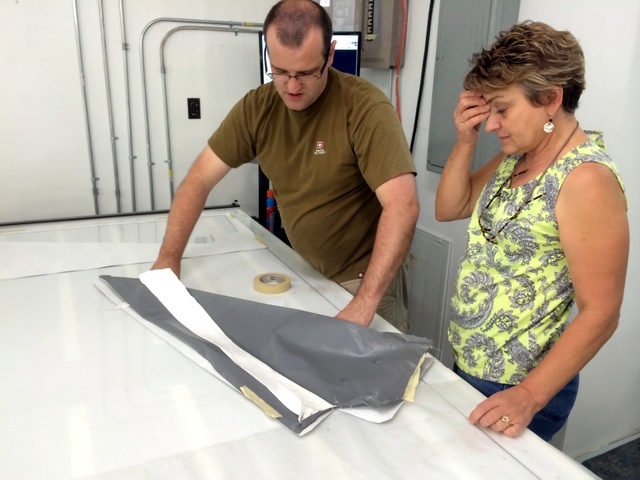 Carol can design anything you need — TLC’s quality products have earned them a reputation in the trucking industry. They are known for their superior durability. 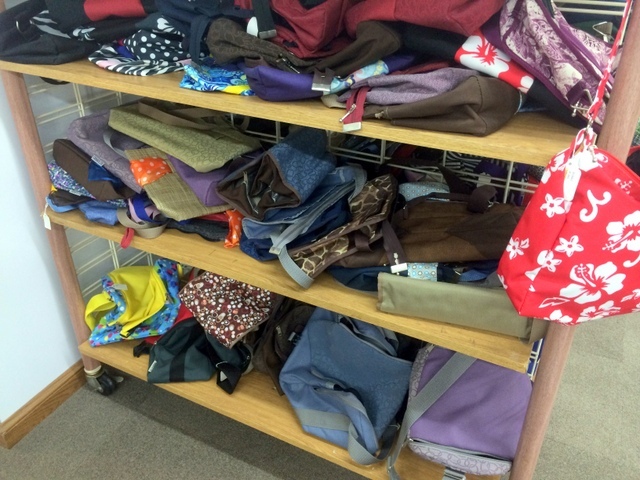 Bag makers are notoriously good sewers, with a fine eye toward quality. 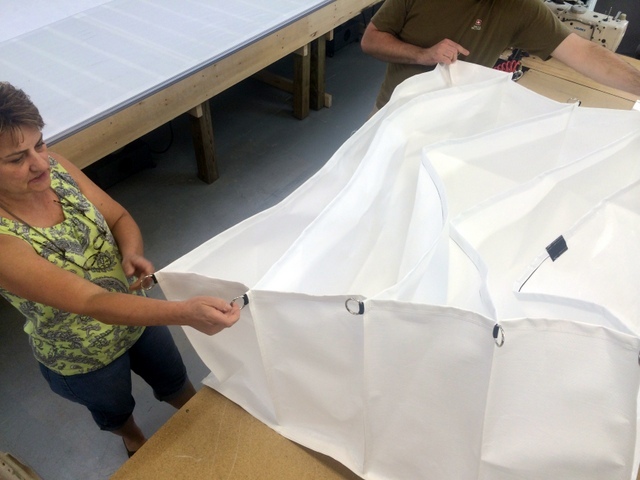 Carol uses here keen eye and years of experience to make products that are built to last. 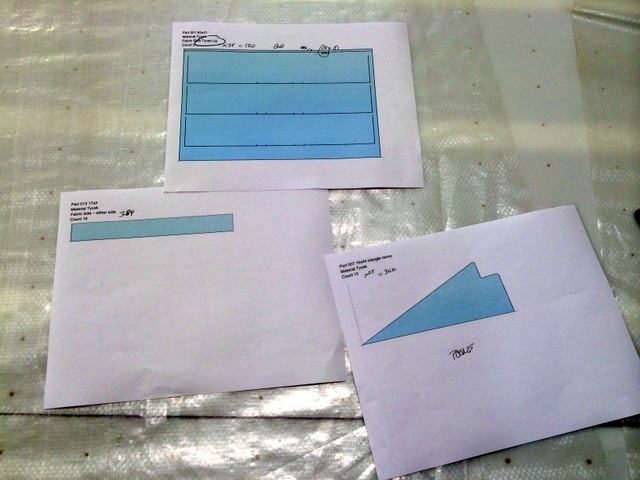 To Begin: Todd designed all of his patterns using Carlson’s plugin for Sketchup. With no previous CAD experience he was able to quickly and accurately create almost all of his patterns. Patterns that are hard to draw can be digitized using Carlson’s Keyboard Digitizing. That’s where you jog the plotter/cutter pen holder around the pattern, recording significant points. Digitized patterns should be checked before continuing. 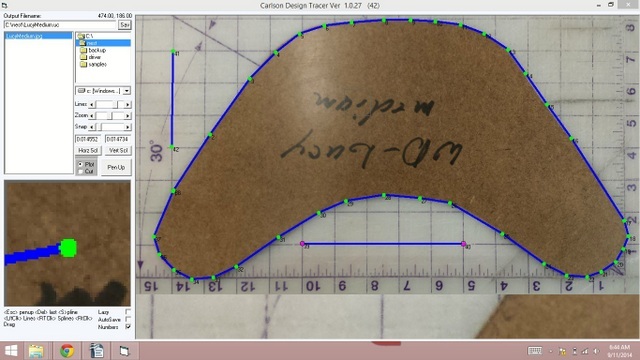 Using Carlson’s Pattern Editor, this digitized pattern was tweaked to account for seam allowances. They also made several improvements to the original pattern. Edits can also be made in Sketchup or any CAD program. 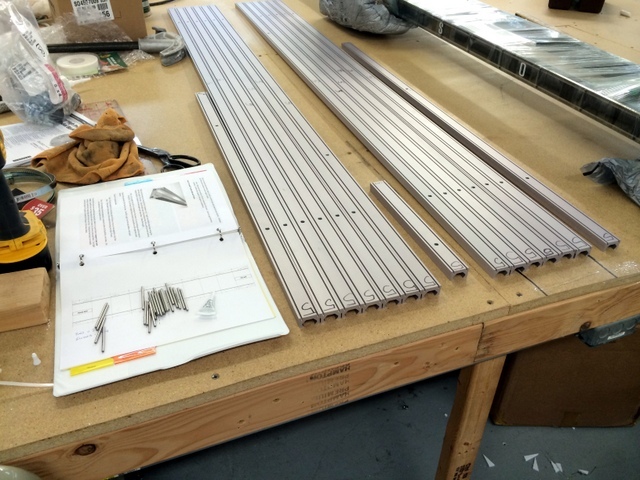 Each of the parts for this job consists of a dozen different pieces. 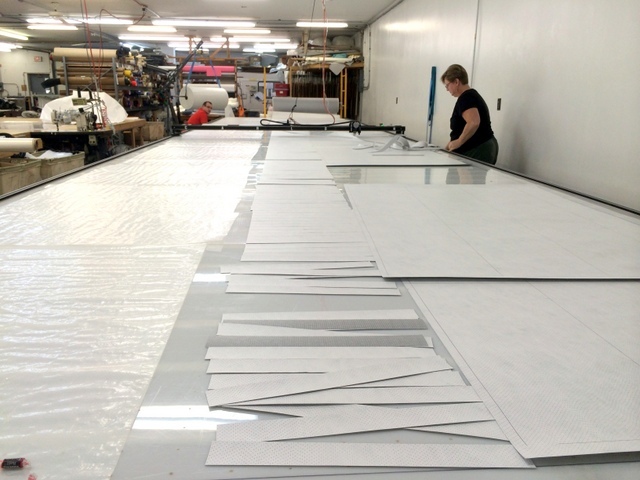 To maximize material yield and reduce nesting time, we used our Autonesting program to automatically layout all of their patterns. This created 24 tables to pull and cut. Each table taking about 10 minutes to plot and cut. 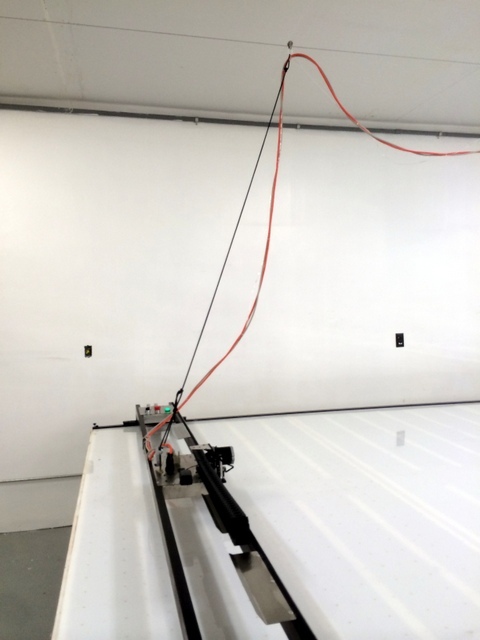 Autonesting allows you to specify part quantity, degree of rotation, and priority. Autonested patterns are optimized in PlotMaster to combine common lines and generate the most optimal plot/cut path. This project is cut out of Tyvek. To begin, pull the roll the length of the table and align it with the plotted alignment mark. 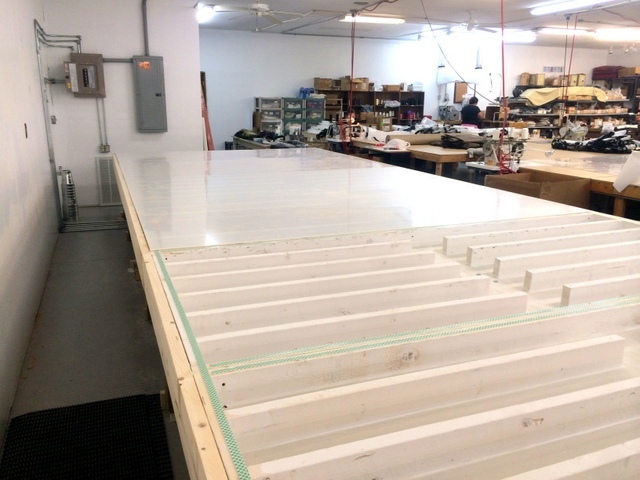 Before turning on their vacuum, they cover any unused parts of their 9′ wide table with plastic sheeting, to prevent vacuum leak. Todd supervises the first cut…. 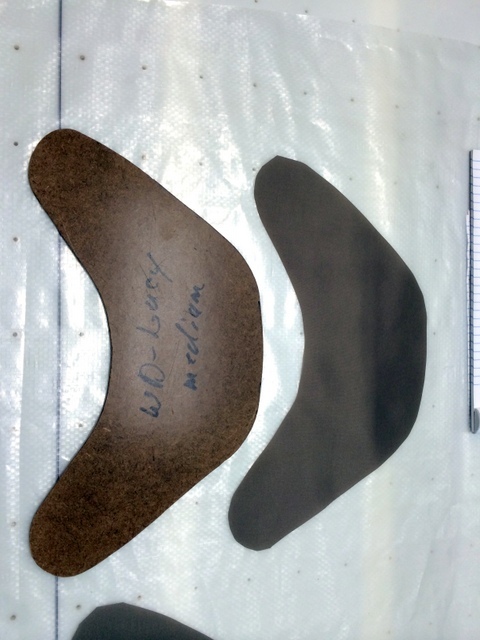 They cut these 25 parts in seven minutes with a 98% material yield – marked and notched! Sue is clearing the table — nesting results in minimal waste and optimal plot/cut time. Patterns are nested for minimal waste. Once finished, cut parts are checked. They are a perfect match! 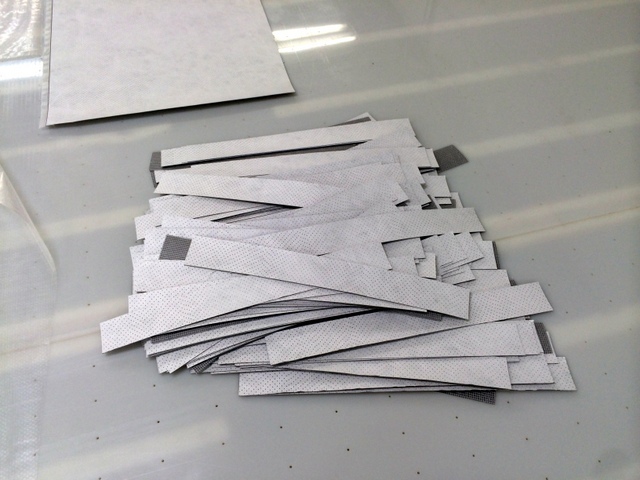 We cut over 200 identical sleeves in less than 20 minutes. This resulted in over 200 minutes saved in cutting! That’s $50+ dollars per cut. If they saved $50/day they would save almost $15,000 a year. We cut over 200 sleeves in 16 minutes vs. 221 minutes by hand. That’s a direct labor savings of $58 in this single cut. If they saved $58 per day — that’s almost $15,000 per year in just cutting labor savings alone. Sewing times can improve by 10-20% thanks to square cuts. 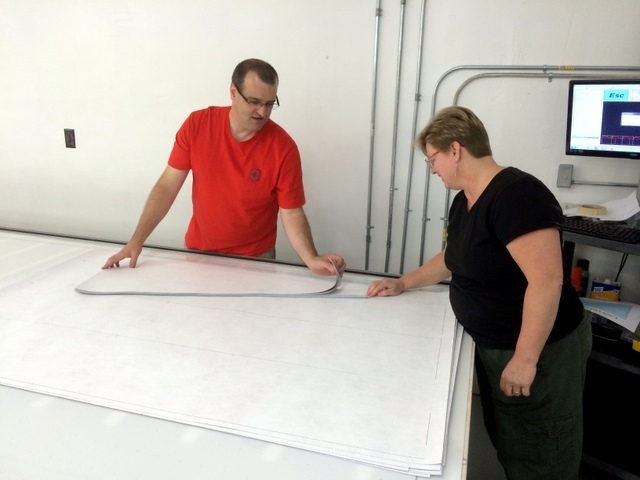 We test cut a wide variety of fabrics and product lines during training. The goal is to address both upcoming production and increase exposure to everything you might want to cut on the new table. 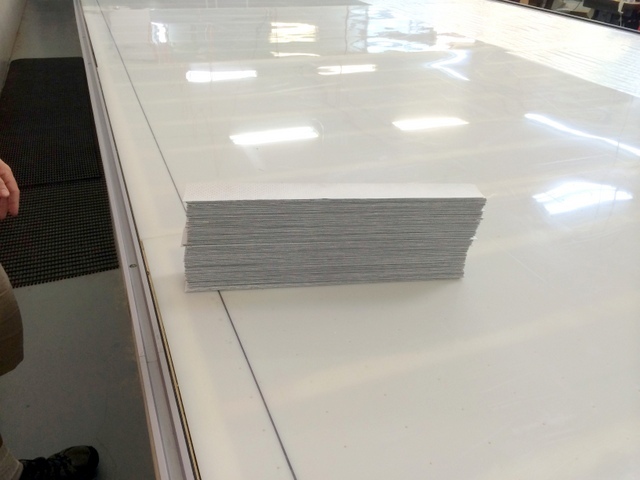 Square cuts are made quickly and accurately with seam lines marked. 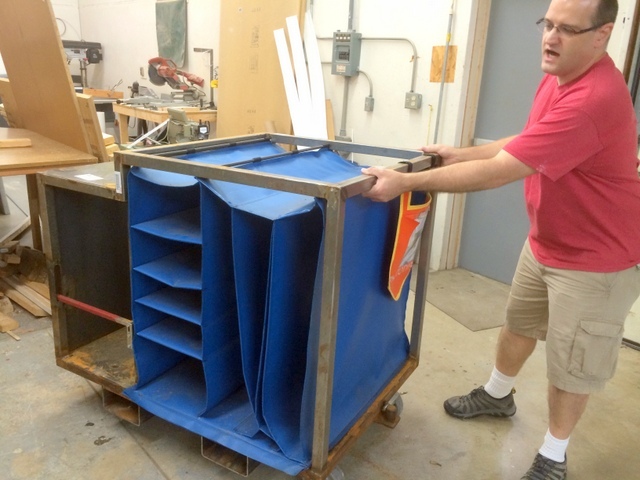 This demo bin was shipped for R&D/ Design. 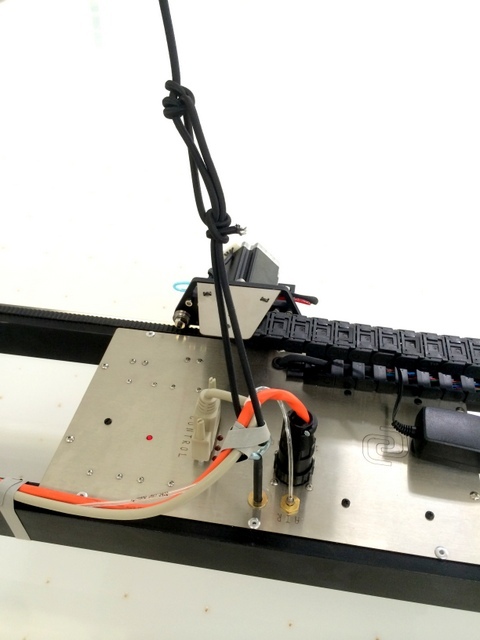 Slots for cross bars, pulleys, and slides are easily marked for quick and accurate production by the plotter/cutter. No more punching! 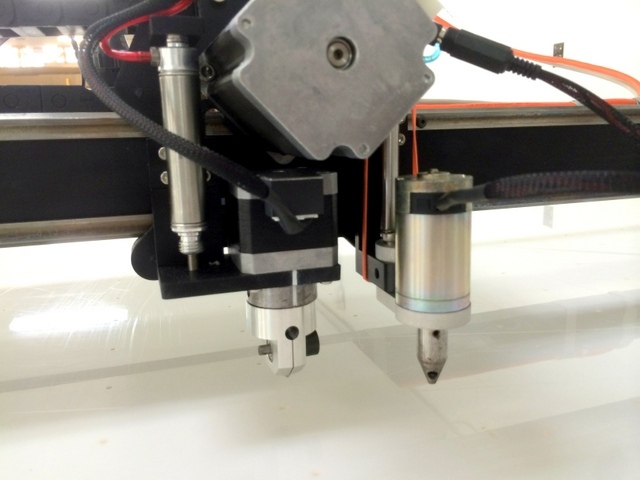 Drain holes are quickly cut by the plotter/cutter. 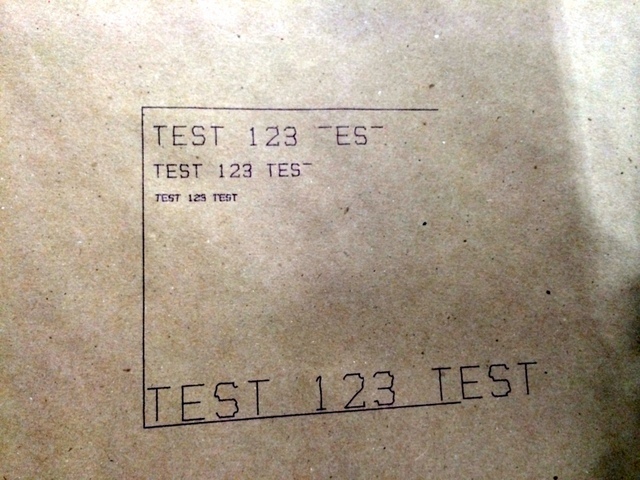 They have been estimating one minute per piece, but the plotter/cutter is consistently cutting at 20 seconds, with marks and notches — something not included in their original one minute estimate. 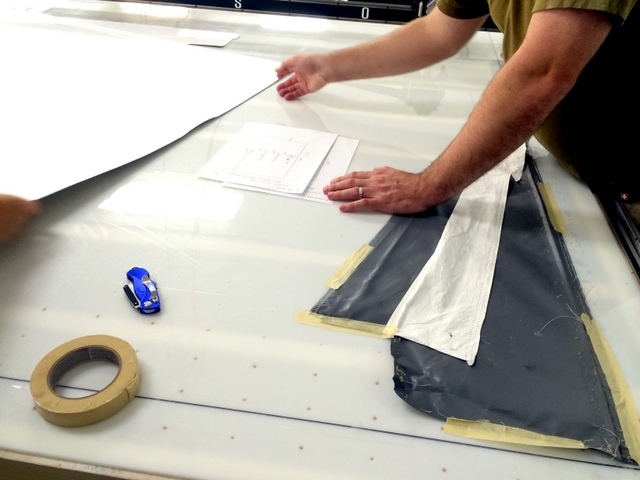 On average Todd estimates the plotter/cutter is 10x faster than hand cutting. TLC Kanvas prides itself on being able to design, manufacture, and distribute the the highest quality custom canvas products. They are really excited about an up-and-coming new dog collar product they have been making for a local entrepreneur. They manufacture a new very cool, up-and-coming dog collar. 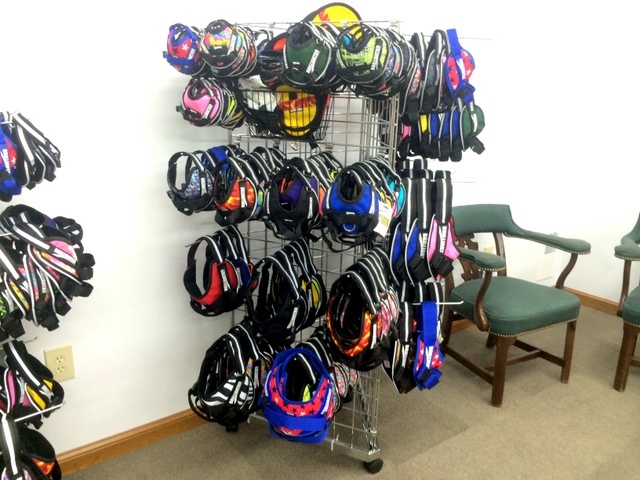 As demand grows, it’s important to be able to produce a wide variety of sizes and colors efficiently. 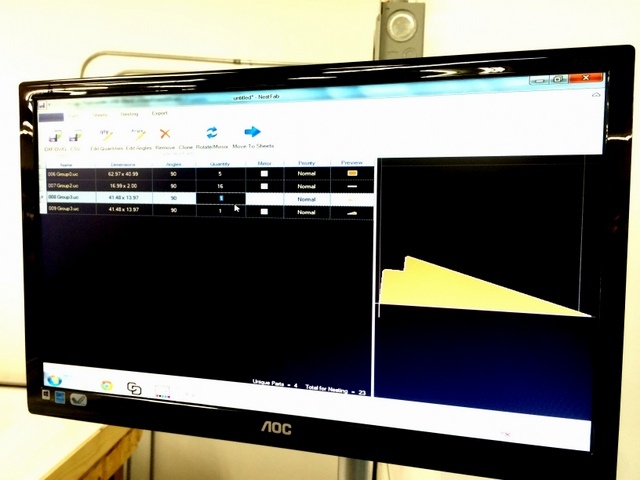 We digitized one of their medium collars using CD2D, Carlson Design’s proprietary 2D photo digitizing software. This allows you to manually trace and scale any pattern you can photograph. Digitized patterns are checked against “the real thing”. Often the digitized pattern is more accurate because straight lines are finally straightened! 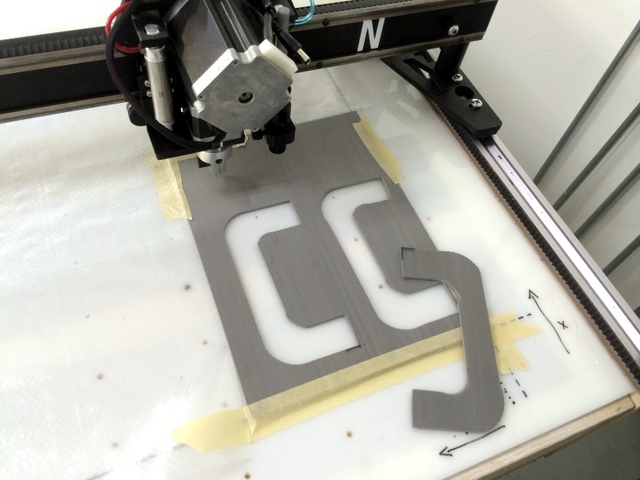 Even the foam for the dog collar handles are cut with the plotter/cutter. Our blade holders magnetically mount, allowing you to quickly and easily switch to a drag blade when cutting thicker foam material. When they were making their bags they had over 150 sales reps across the country. Using the internet and catering to small entrepreneurs they are now able to manufacture fantastic products without needing to manage a large sales force. 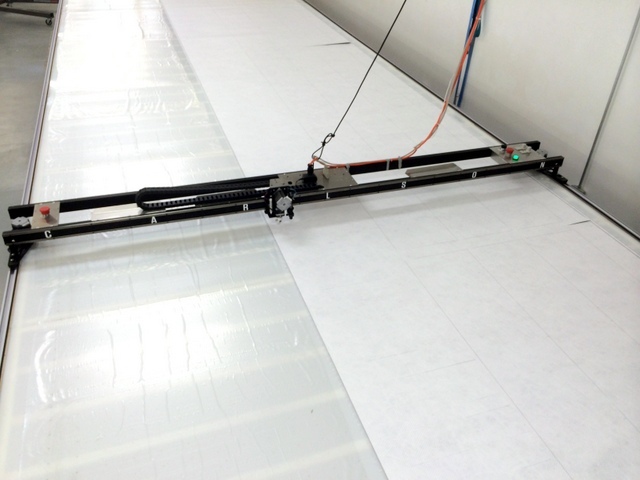 TLC Kanvas ordered a rotary punch to make consistent marks that can be seen on the backside of the material. The rotary punch mounts in place of the pen holder and can be added or removed in less than 15 seconds. 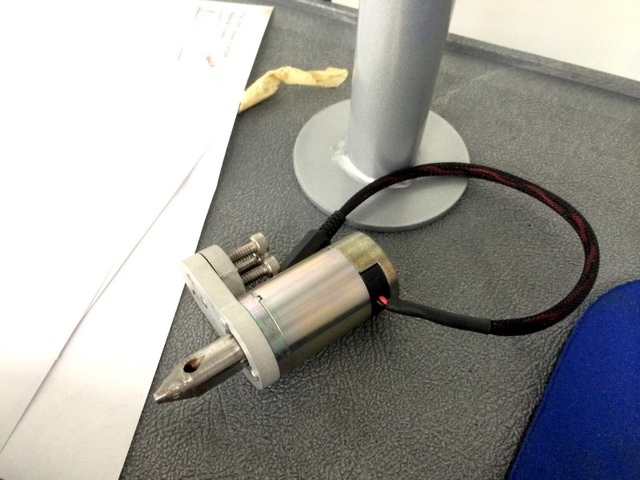 The Carlson Design Rotary Punch attaches in place of the Universal Pen. The punch plugs into 120vac power via the auxiliary outlet on the center panel of the machine. The punch can be attached in about 15 seconds. The Rotary Punch is easily removed between plotting and punching. Punch tips can be sharpened in house. 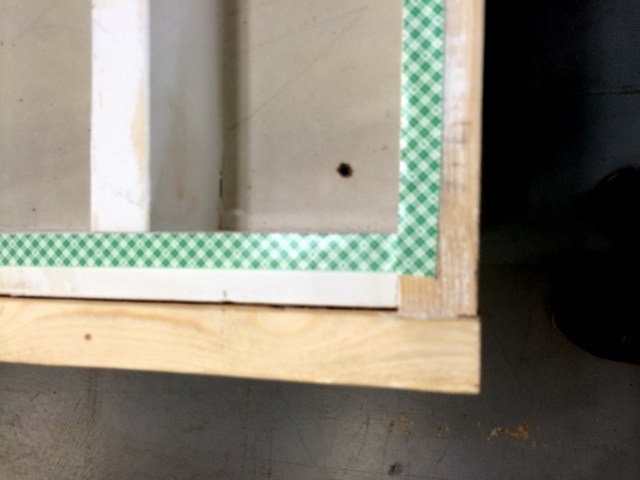 The punch is a great tool for marking holes that need too bee seen on the backside of the material. 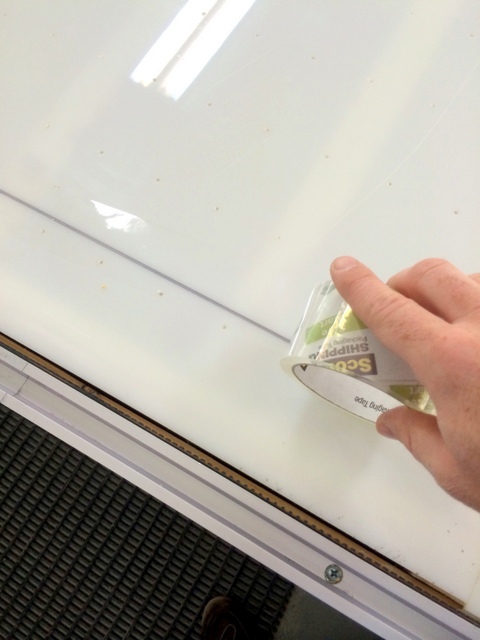 You can also use the cutter to mark holes. 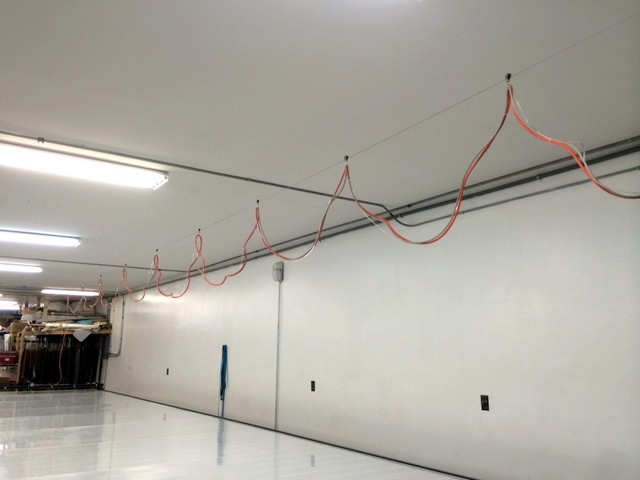 We would like to give a big thanks to the TLC Kanvas team that made such a successful installation possible. Here’s to Lonnie, Carol, and Todd! Carol wouldn’t let me leave before fixing my bag!! Todd admiring the leftover waste from the last cut! OK, let’s have a look at their installation. 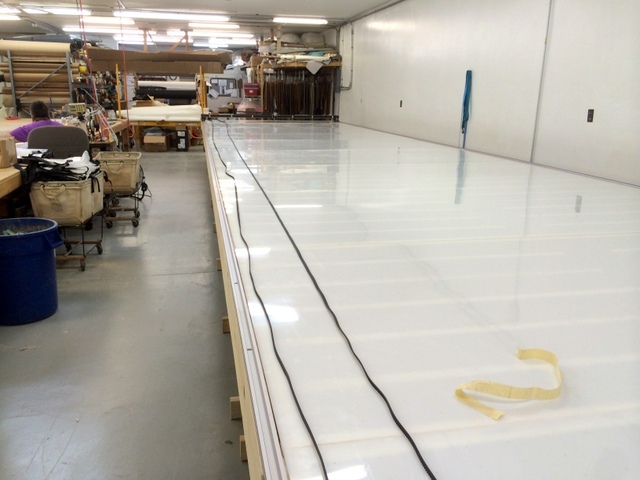 A few things to note — TLC Kanvas decided to build their own 9′ wide x 40′ long, which they prepped and assembled before we arrived. We provided plans for the table, which they adapted according to their building materials and application. 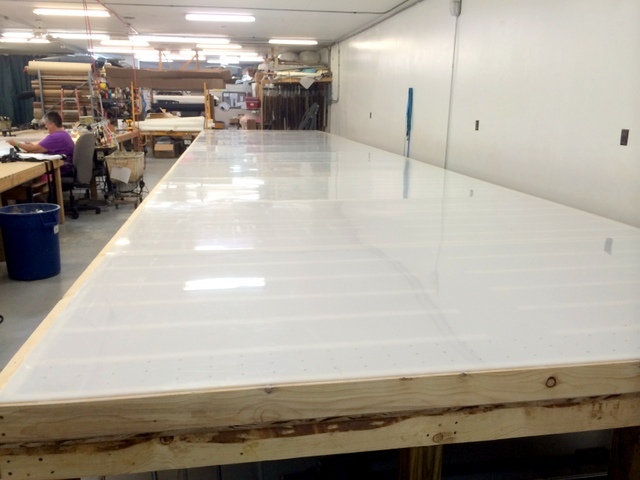 A Carlson Phillocraft table 9’x40′ is $35/sqft and would cost $12,600. 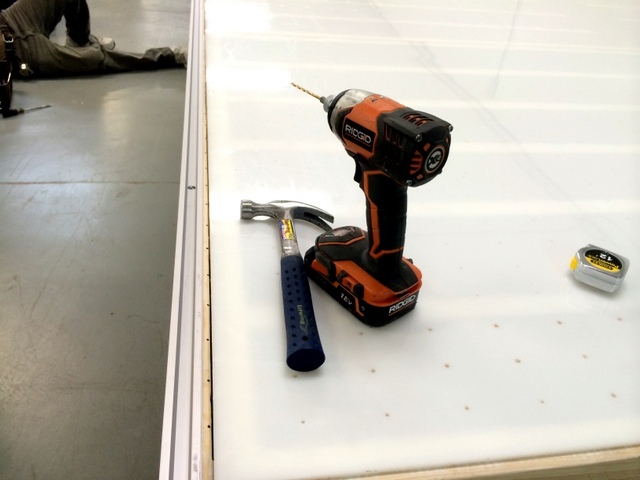 The Phillocraft tables come in endless 4′ long steel frame sections and are easy to assemble, however they are not so special, so many customer build their own. 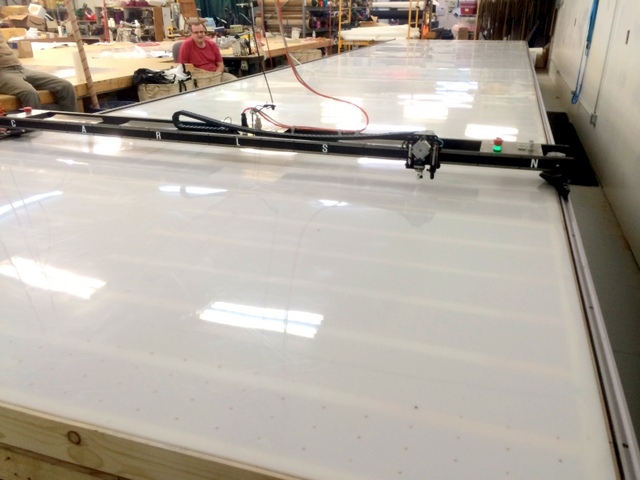 Lonnie estimated it cost them $3000 to build their table (excluding labor costs). This is a great way to cut costs, allowing them to justify buying a wider system. Anyone who has ever shipped something knows fragile stickers are ignored. Note the footprint near this one. 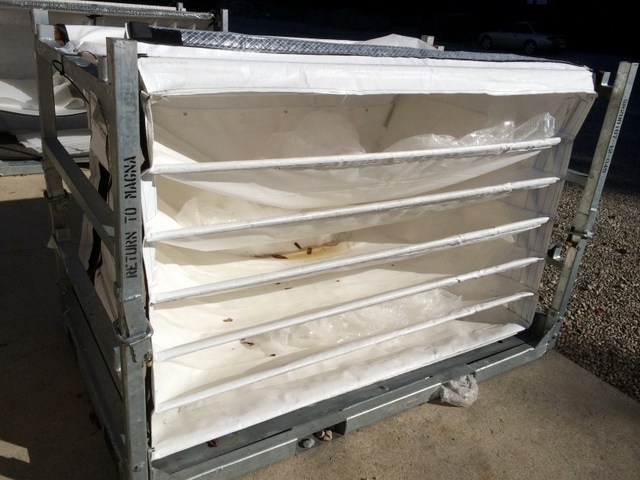 Carlson shipments are well packed in double-walled boxes, secured to a skid or inside a crate. 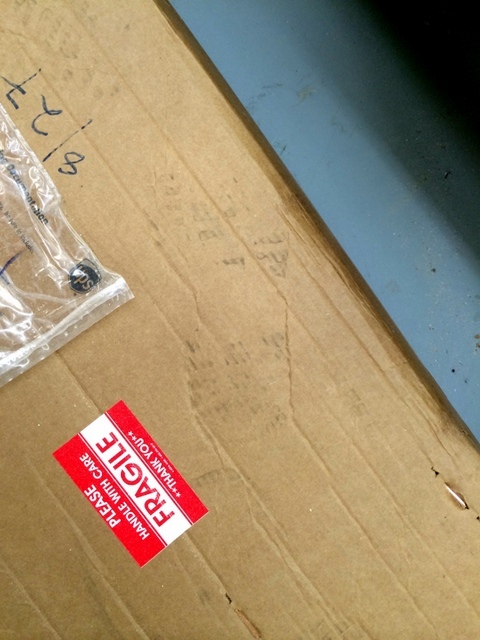 It’s important to inspect your shipment upon arrival and report any damage immediately. Luckily their shipment was safe and sound. 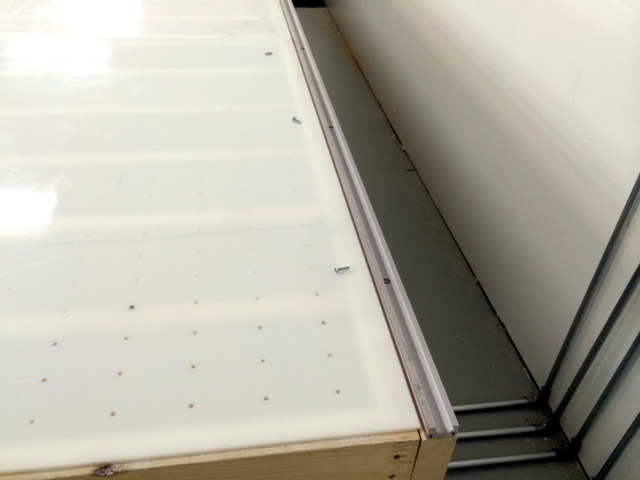 Once unpacked, layout the track according to the manual and Loctite pins. This will give the Loctite a chance to setup while you do something else. 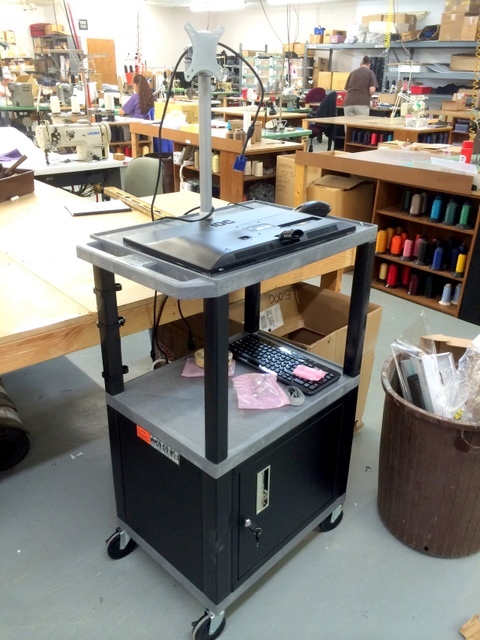 Unwrap the Plotter/Cutter. Inspect for damage. Assemble the operator’s workstation. This is for the keyboard, a monitor, and provides a lock-able box for your computer and spare parts. 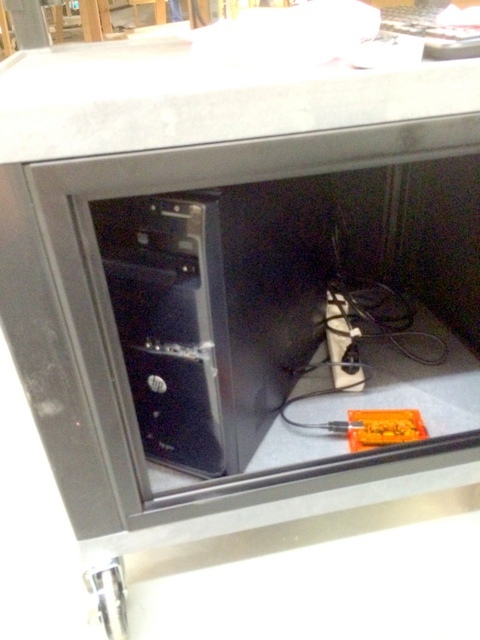 Your preloaded-and-tested computer can be ssecured inside the operator’s workstation. Of course, you are also welcome to provide your own computer and workstation. 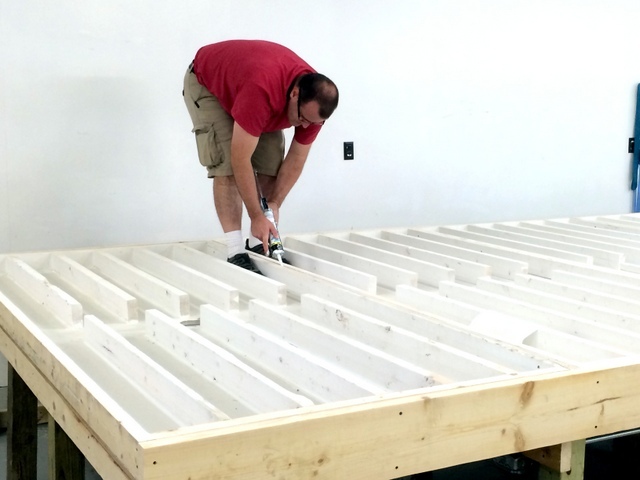 Todd puts the final touches on their home built table by caulking the seams. 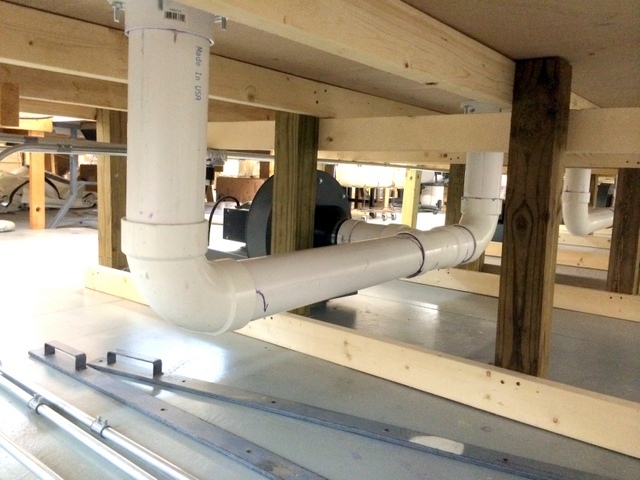 They built a large plenum, with plans to make their cutting surface the top of the table. This is a new idea they wanted to experiment with. 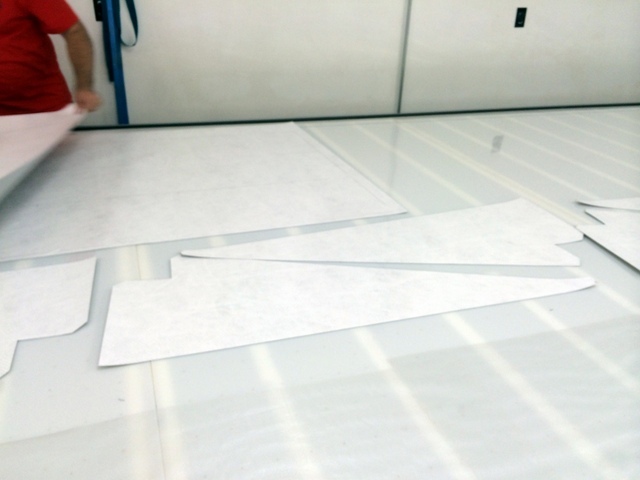 We foam taped the edges of the table and all of the seams to make a good vacuum seal with the HDPE cutting top. Adding their HDPE tops (sourced locally) to the top of the table. They purchased thicker tops, to make a more rigid top. Table all done! Looks pretty darn good! They put a screw on the bottom of each leg so that it was easy to level. When building your own table, it is important that the table is very level for a fast system. Once they leveled the table they screwed a board to the edge to prevent it from shifting over time. When the track pins have set, it is time to set side A. Layout the track according to the manual. 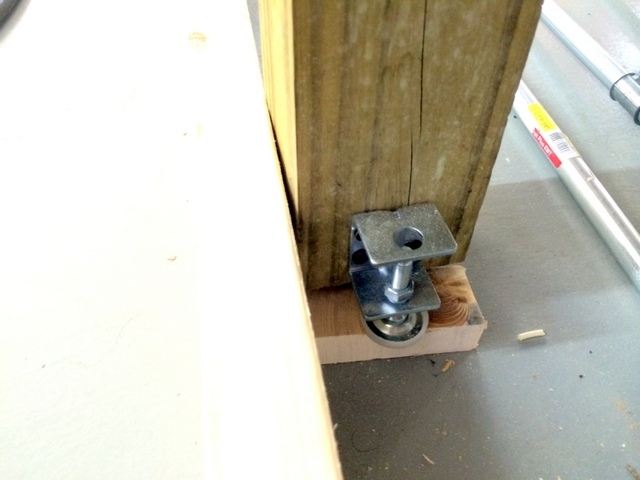 Align as straight as possible and secure it to the table. Punch, pilot drill, and hand screw each hole. Set side B with the plotter/cutter as a jig. 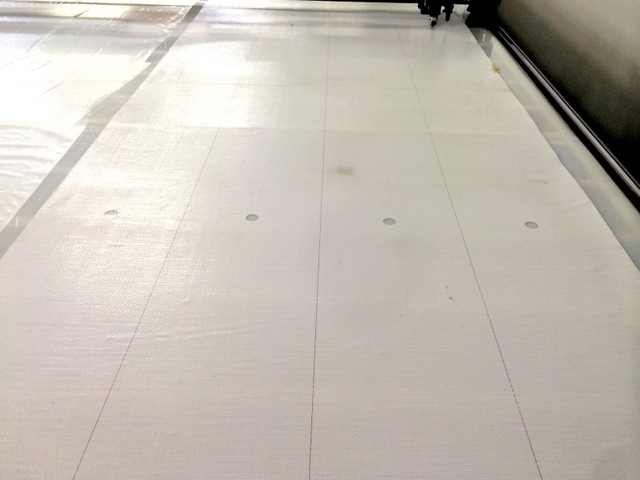 Layout the track and Loctite before attaching the Plotter/Cutter. 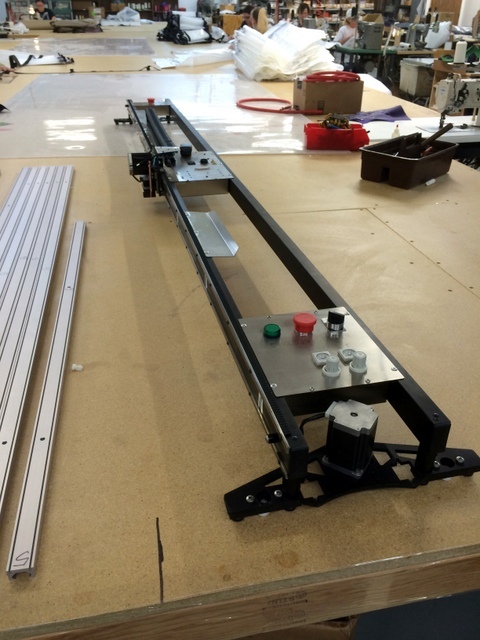 Before attaching the Plotter/Cutter, add track trolleys and adjust them to your track. 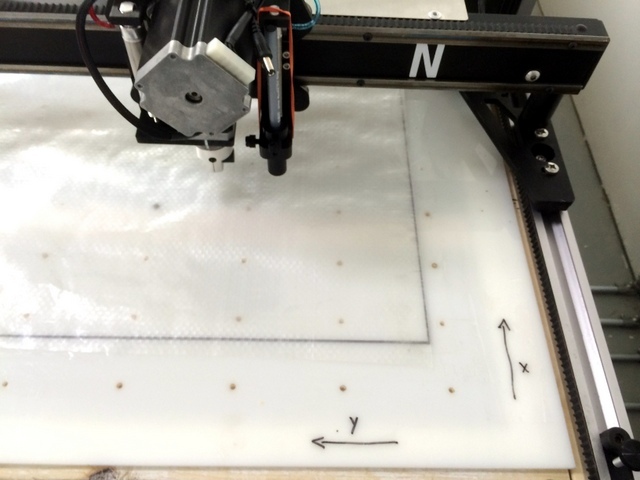 Use the Plotter/Cutter as a jig to make sure that side a is parallel to side B. 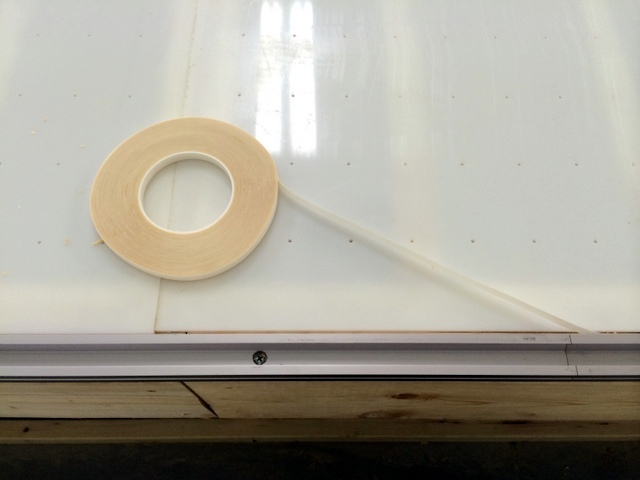 Attach double sided tape to track. 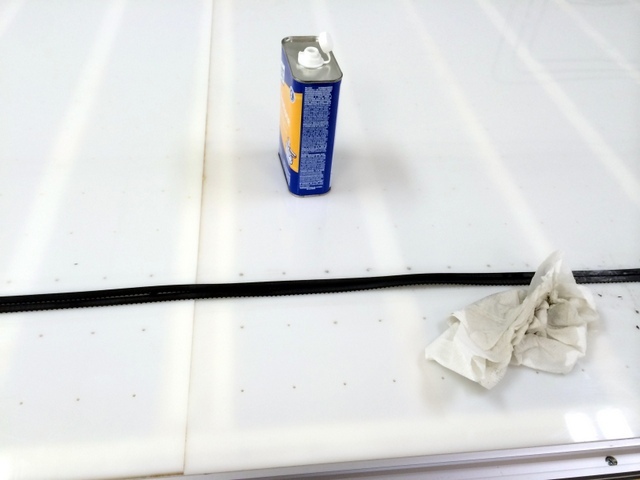 Spread out track belt for easy cleaning. In order for the belt to attach to the tape it needs to be rubbed down thoroughly with acetone or abraded with sand paper. Attach the belt with even tension on both sides. 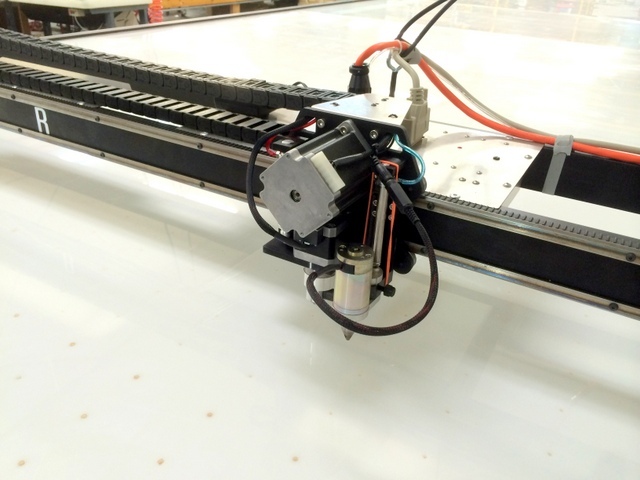 The Plotter/Cutter is driven with three cables — air, power, and control. 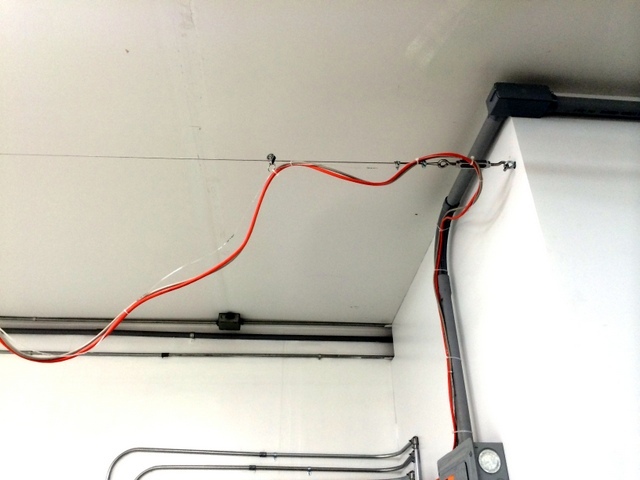 Zip-tie the three cables together in 1′ -3′ increments. 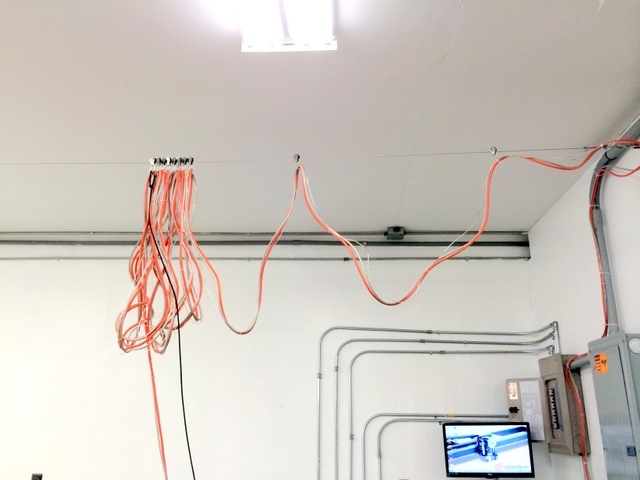 Run the overhead wire for the cable management. 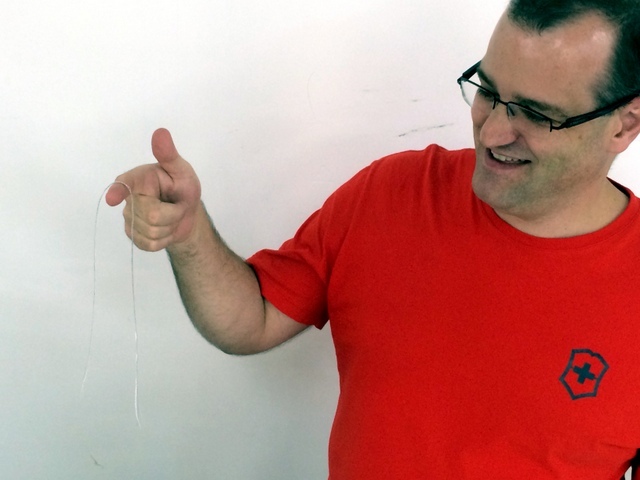 A turnbuckle makes it easy to tighten the cable. 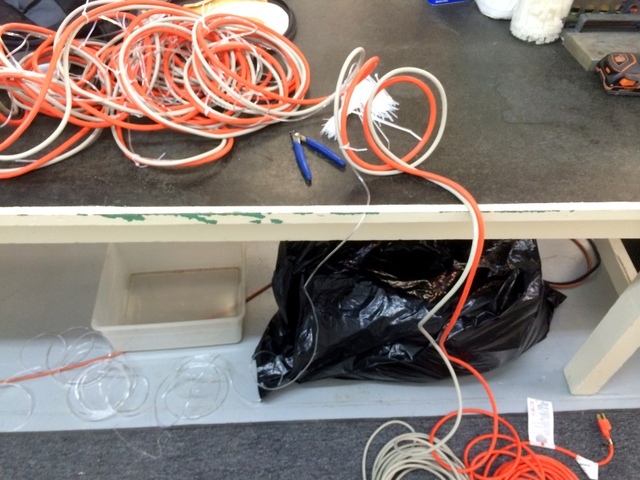 Start the over-head cabling from the end of the table and run it toward the computer. 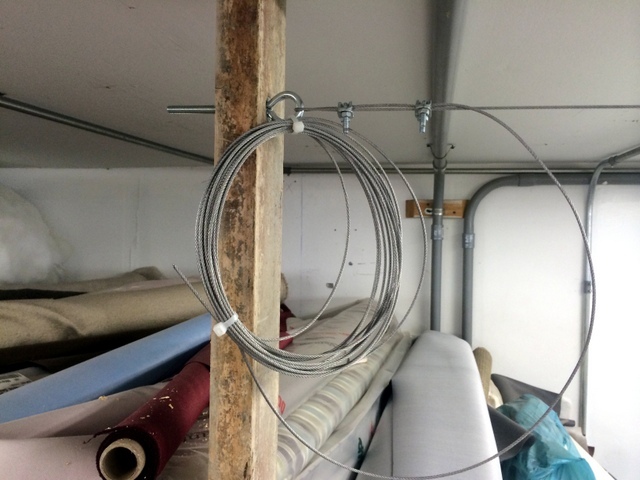 Put about a 2-4′ drape in the cable. Secure the end of the cable properly and run to the computer. 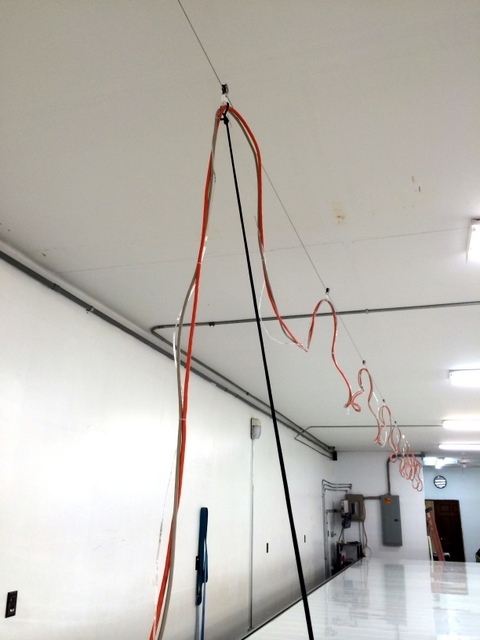 Attaching a bungee to from the cutter to the first pulley will prevent cable damage. 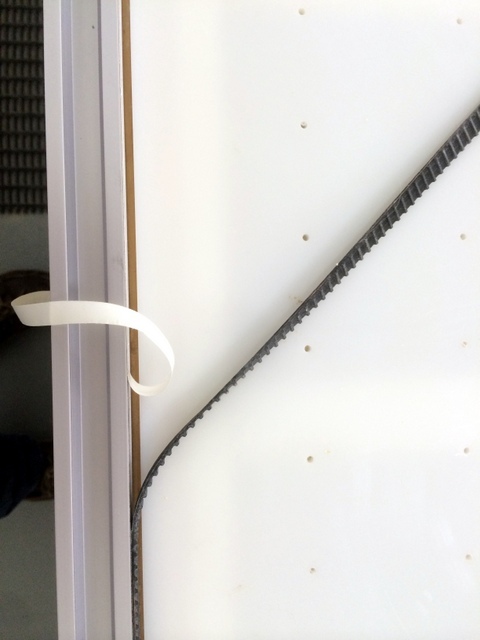 Attach bungee to the eye bolt on the center panel of the Plotter/Cutter. 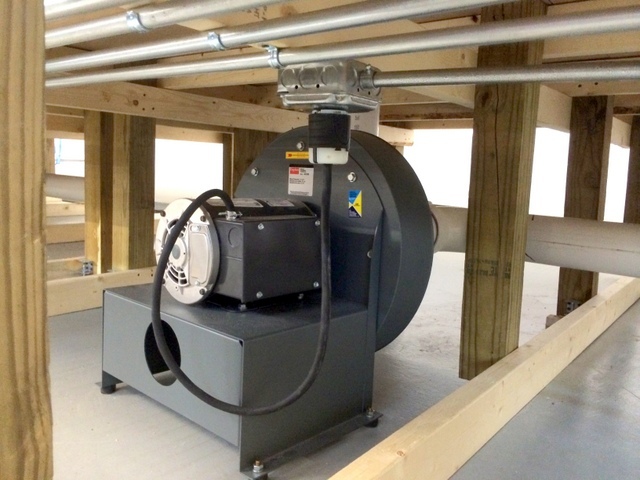 Blowers are sized by job and your building’s available power. They decided to use multiple, smaller, 3Hp radial blowers. 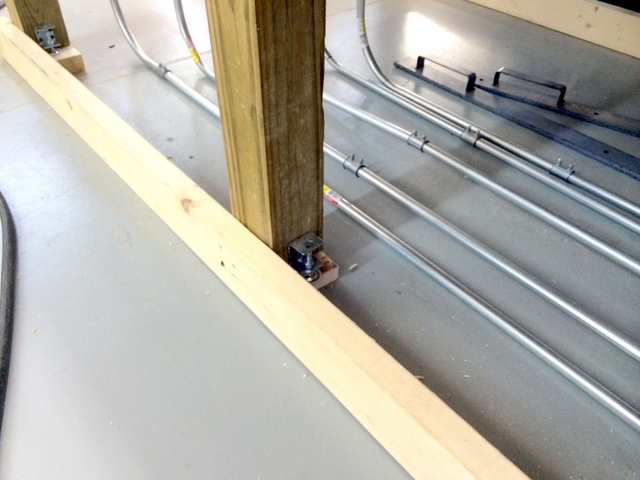 This fits their power requirements AND allows them to divide their table into more zones. 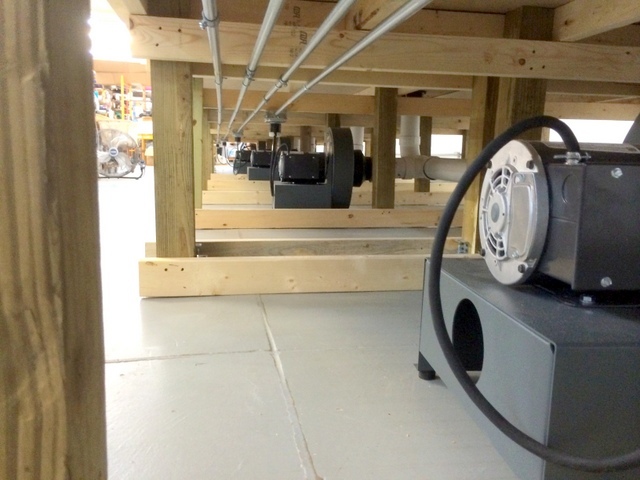 We recommend one 3HP blower every 75sqft. They are using five 3HP radial blowers. 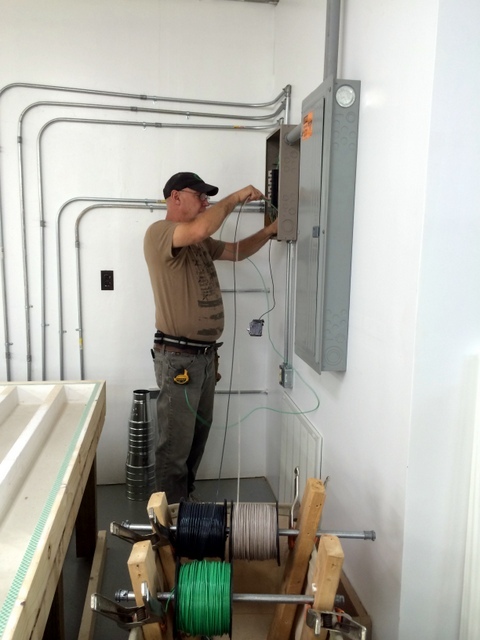 They decided to wire each blower on its own plug for easy reconfiguration and service. Place a “Sharpie” in the universal pen holder and postion the cutting head at the extent for plot and cut. 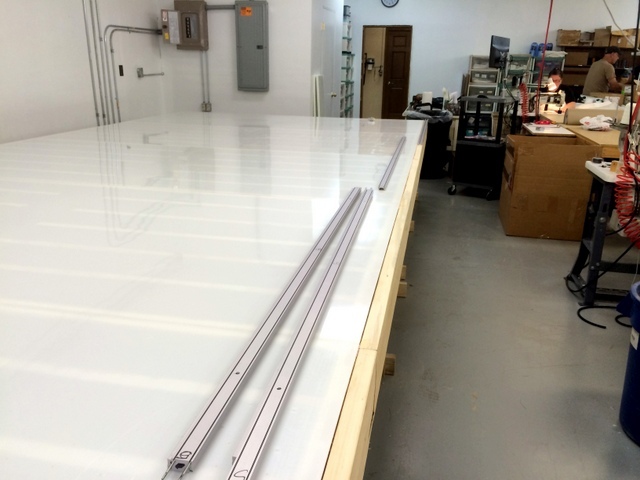 Drop the pen and jog the system the length of the table to create a fabric alignment mark. 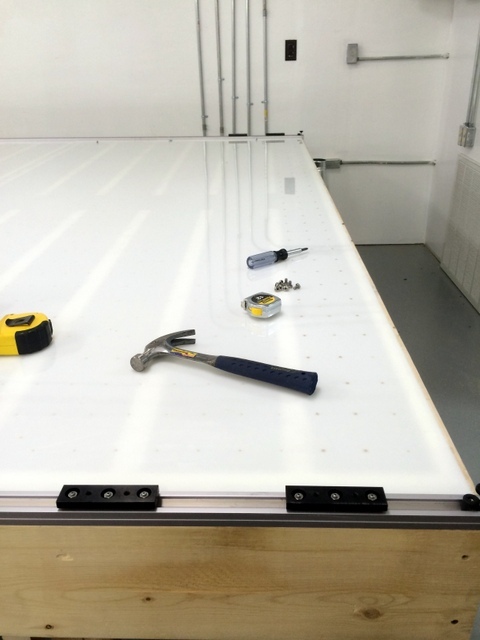 Once the installation is complete, it’s time to calibrate and square your system. 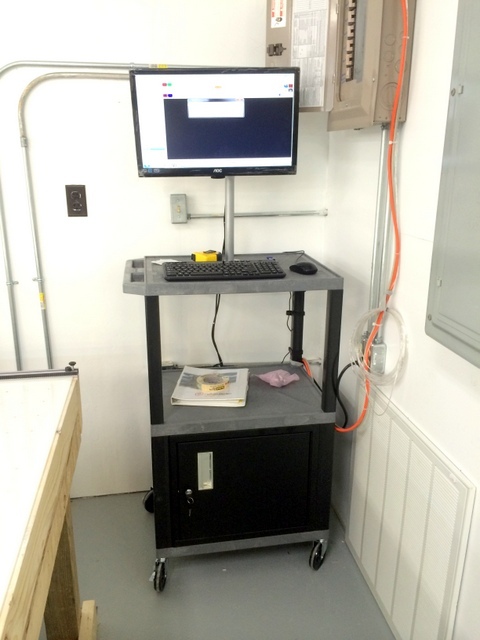 Factory calibration is listed in your manual, however it is still necessary to scale your system to your table. Calibration is quick-and-easy. 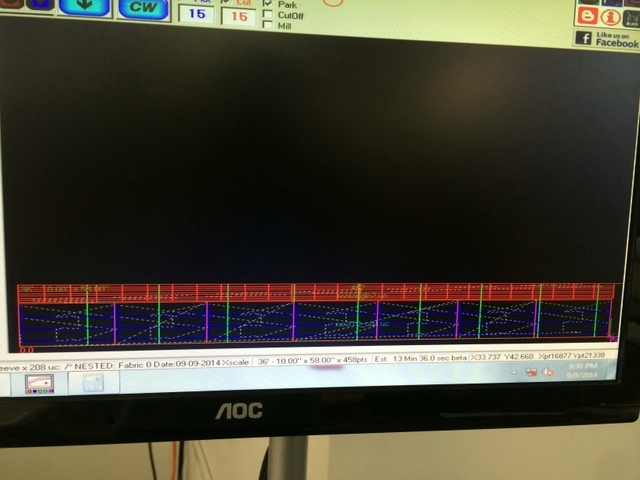 Simply hit the calibrate button and measure the lines drawn. We recommend you calibrate at least once a month. 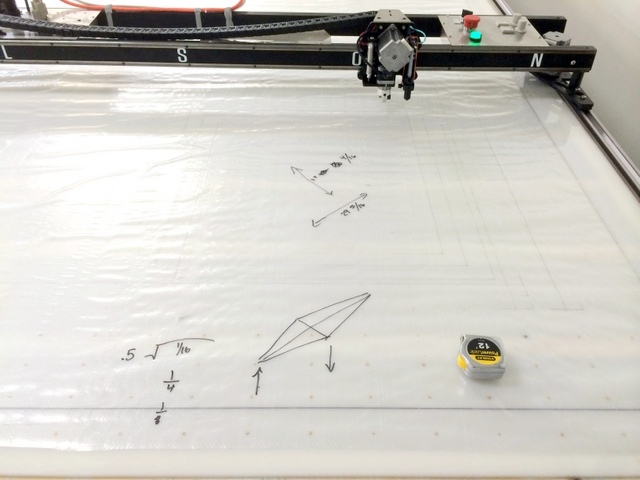 Once the plotter/cutter is calibrated, square the system to the track stops. They concluded with a test of different font sizes — .5″, .3″, .2″, .1″. Thank you for a great install. Big thanks to Sue, Lonnie, Carol, Todd, and the best of the TLC Kanvas team. We look forward to stories of their future success!